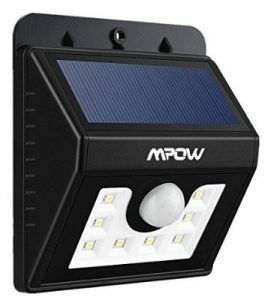 Following is the review of best motion sensor led lights available in India. If you are looking for light sensing LED lights, here is another list of best Light sensor led bulbs (sense light and then adjust brightness accordingly/turn on/off). Some lamps listed below have both light and motion sensors. Finally we have few solar powered led lights (Mostly for security purposes) with motion sensor and light sensor. How does motion sensor led lights work? These led lights have small motion detectors integrated to them. Motion detector is an electronic device which is a main component of security devices, automatic lighting control systems, and other energy efficient devices. It designed to detect moving objects (especially warmer objects like human, animal or vehicles). It detects moving objects by the presence of heat waves and infrared waves. When the detector senses an object moving across its reach and automatically turns on. Following products are selected based on quality, customer opinions, and motion sensitivity. Sensitivity of following lights can be manually adjusted. This will help these lights to turning on by very small movements in surroundings. These bulbs are widely used for security purposes. 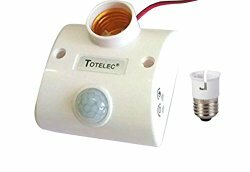 But can be used in washroom, stair case area, Parking area, Near the entry, Utility area or any place that needs light to be turned on and off often and light requirement is for shorter duration only. This is a 10 watt motion sensor led bulb . This is a cool daylight bulb. Motion Detection Distance is 3-4 meter (8-10 feet). Is bright enough for lighting 10 feet by 10 feet size room. Bulb holder is B22 type which is one of the most common led base types in India. Will be automatically turned off after 90 sec (If there is no more motion in range). Pros – Good brightness, low price. Cons – This will NOT be turned off automatically during day time. Because it does not have light sensor. This is a 6 watt motion and light sensor led bulb. Have motion detection range of 15 to 20 feet. Will automatically turns off after 60 seconds. Pros – Unlike the above one this bulb automatically turn off during day time. Because it has light sensor also. Cons – Works best while used indoor. But not very good for outdoor use. This is a surface mounting type LED motion sensor light. This is best for washroom area ,stair case area, Parking ,Near the entry, Utility area, car porch etc. Energy usage is 18 watt/hour and have operating voltage 160v to 250V. Motion sensor is powerful enough to detect movements within 3-4 meter/8-10 feet. Operating angle is 120 degree. Pros – Turns automatically off during day time (No need to switch off).This 18 watt led light is bright enough for outdoor use also. Looks very nice and is also light weight. Cons – Cannot be used in normal B22 bulb holder (can be mounted to any surface with screws). This is a unique product in this list because of some extra features. First of all this is a solar powered led light. Have both motion sensor and light sensor. It will turn off automatically when there is presence of lights and will turn on in darkness. Solar powered system makes this led light perfect choice for Garden, or any other outdoor lighting purposes. Company claims that it can detect people/objects within 26 feet. Comes with Three Intelligent Modes. Strong Long Light Mode, Dim Light Sensor Mode and Strong Light Sensor Mode. Read more. Pros – Can detect movement within 26 feet, is solar powered, and can sense presence of day light. Therefore Best option for out door lighting. Cons- Not for indoor lighting. This is not an LED Light or lamp. But i think it is qualified to be here. This bulb holder turns on attached bulb when there is any movements in its range. Delay time of holder can be adjusted from 10 to 60 Seconds. Pros – Can use any bulb/Led bulb with this motion sensor holder which is great. Also able to sense day light ! Cons – This holder is of E27 type. But GOOD NEWS !! is that company provides Free E27 to b22 converter with each product. Best for washrooms areas, bathrooms areas, kitchen area, passage, balcony, corridor, porch etc. Comes with several customisation options. It is possible to customise delay time (delay & light adjustment). Pros – Also detects day lights and turns of accordingly. Cons – Not very good for outdoor lighting, It is surface mounting types.